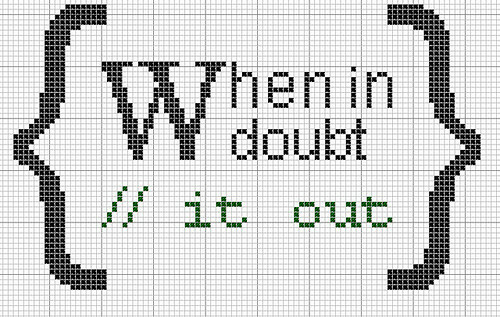 This quick little techie cross stitch chart, perfect for the programming geek boy or girl in your life, was a design I did a few years ago now that made teeny tiny little waves in this vast and unending sea of crap we call the interwebs. I was rather proud. It was on Craft Magazine's site and Craft Gossip and everything. Well, actually those two were it. Anyways... when steaming through Debenhams (the picture they have of Jasper Conran in there gives me the creeps) to get to the drug store yesterday I saw that there was Christmas stuff already on display. 2) Realize that if I want to give anything hand made to anyone for the coming non-denominational winter festival I had better get a move on. All my other free charts are there on flickr for your stitching delectation. I will be posting up my past Christmas charts and I hope to do some new ones this year as well. In other news I am kiln shopping tomorrow. So for all you who are eagerly awaiting new even-star ceramic creations the time may be at hand! Do you love the free content and cross stitch charts you find here? You can help me continue to keep on posting by clicking on ads you see on the site or by donating directly. All content on this blog is copyright of even-star Hancock. Material is for personal use only and not to be sold or used to produce items for sale. It is not to be modified and sold or modified and used to produce items for sale. Please feel free to post links to my charts but please do not post them on your own website. Pickles are SO Rood! So Here is a Cross Stitch Chart of One. Being Rood.